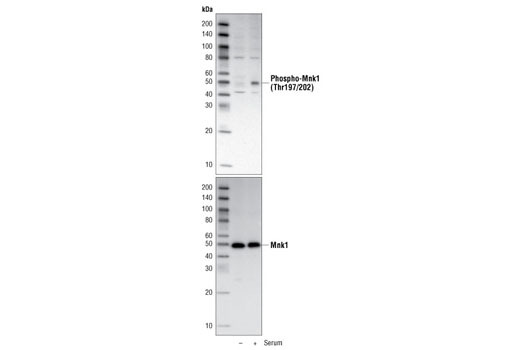 Western blot analysis of extracts from NIH/3T3 cells using Phospho-Mnk1 (Thr197/202) Antibody (upper) and Mnk1 (C4C1) Rabbit mAb #2195 (lower). The cells were starved for 24 hours in serum-free medium and then either untreated (-) or treated with serum for 30 minutes (+). Phospho-Mnk1 (Thr197/202) Antibody detects endogenous levels of Mnk1 only when phosphorylated at threonines 197 and 202. The antibody also cross-reacts with phosphorylated Mnk2a and Mnk2b. Polyclonal antibodies are produced by immunizing animals with a synthetic phosphopeptide corresponding to residues surrounding Thr197 and Thr202 of mouse Mnk1. Antibodies are purified by protein A and peptide affinity chromatography.